Bought this at SOGO with bargain price : ) 50% off. White frame. Preparation for BF Gradution Photo next week :). Bought at Daiso for only IDR 22K. Coffee cup for BF. He likes brown, he likes coffee. So, i think this cup will perfect as a gift for him. Bought at Daiso too. Ella Noir Body Douche. Or simply call it Shower Gel :). Got this at Hero supermarket with bargain price. There are 3 varian of Ella Noir and I pick the Viollette one. It come with 2 different soap for morning bath and for night bath. The smell is great :) Love it. 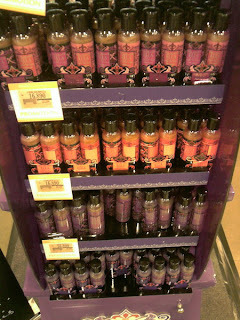 The Ella Noir Display at Hero Supermarket. Spot the price for only IDR 16,5/ package. 3 varians colours pink, orange, and purple.